Cast iron cookware is not just trendy- they’re great for getting that lovely nonstick feature that people pay top dollar for! I also just love the look of a meal cooked in cast iron cookware. Something that started as a simple dish or an everyday meal just looks a little more gourmet when presented in a well-seasoned cast iron skillet! The great thing about cast iron is it’s REALLY hard to mess up- even when you end up with a little rust! You can get your dish looking brand new, and depending on how much rust you have, it might be easier than you think! There are several ways to scrub off the rust. *This can be done with a steel wool pad, and it works incredibly! Don’t be afraid of that thick orange layer- really dig in and all that rust will soon disappear. *If you literally have only a couple orange spots, you can simply try just using a paper towel (lightly dampened with cooking oil) and wipe them away! *You can also use a trusty salt scrub- simply pour a layer of salt on your pan and gently scrub with a paper towel or napkin until the rust has come off. *If you have some really stubborn spots, try using vinegar in addition to the steel wool to help you really clean off the surface. *I’ve also read that you can simply stick your cast iron skillet in the oven and turn on the self-cleaning feature. This will take care of the rust, and all you’ll need to do is make sure to re-season your skillet once it’s done! With whichever method you choose, keep in mind that you’ll probably need to re-season your cookware, especially if you had a lot of rust and now have a thick film of orange on your skillet! 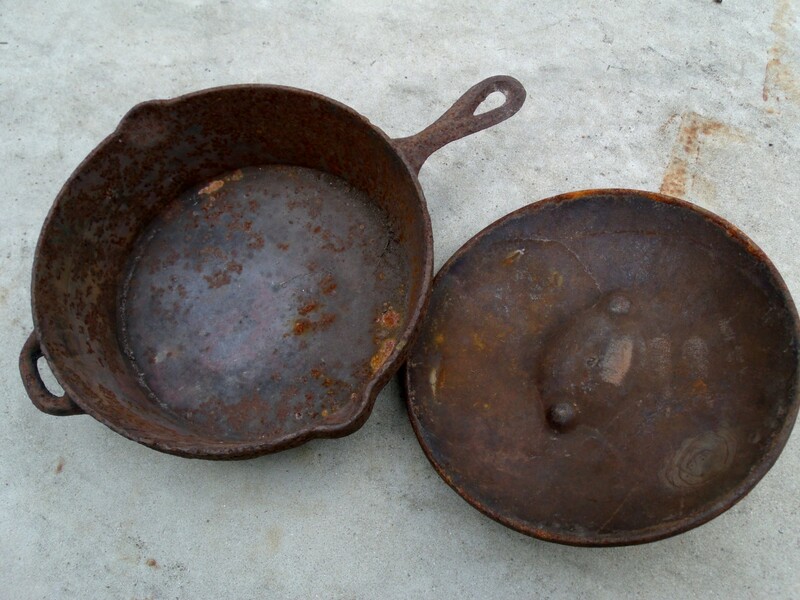 To prevent future mishaps with rust, be sure to clean your cookware immediately after you’re done using them! Letting them sit out by the sink increases the chances for bacteria, and you’re risking water spots jumping out of the sink or simply from someone washing their hands and accidentally getting water spots on your pan. Whenever you’re done cleaning your cast iron cookware, make sure you dry it thoroughly with a towel of some sort, or you can simply put it back on the stovetop for a few minutes to ensure that all the water is evaporated. What’s your favorite method for removing rust off your skillets? Share with us below!